Through financial contributions and volunteering. You can donate using any of the donation boxes on our website or, contact us at katie@zebranation.org to learn more about how you can become involved. We thank you for helping us make a difference. In medical school, students are taught to diagnose patients based on the condition that’s most likely. This idea goes along with the saying: “When you hear hoofbeats, think horses, not zebras.” The horses are the likely explanation, while the zebras are less likely. A medical zebra, then, is a person with a rare medical condition. 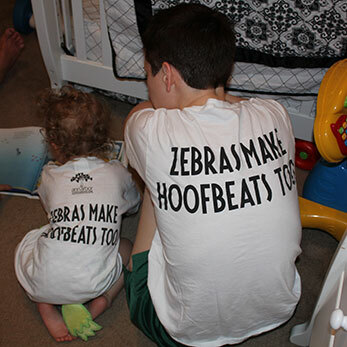 The primary purpose of the Life as a Zebra Foundation is to receive and administer funds for the purpose of education and charitable contributions for education, prevention, treatment, and research of various rare, invisible illnesses including, but not limited to, Ehlers-Danlos Syndrome, Dysautonomia, and Vasculitis.